London-born Daniel Day-Lewis crafts a portrait of Abraham Lincoln as a somber, quiet family man, fixated on pursuing America’s 13th Amendment amidst the waning turmoil of civil war. Lewis portrays Lincoln with a peculiar walk, a penchant for storytelling, and a man who appreciates moments of solitude. Tensions boil over as the war nears its end, the Amendment a piece of political posturing, but one Lincoln is sure of. His own cabinet is seen against the measure, not in practice, but in difficulty. Divisive votes amongst political parties are presented for modern relevancy; we have learned nothing from our past it seems. This portrayal of Lincoln is not of a booming speech giver or direct idealistic American political hero, at least not within the characterization. He is a strategist, someone who works over his rivals through subtle and then forceful means, even if they continue to reject his methods or morals for the sake of their party. Much occurs in the background, away from reporters, rather in offices or casual meetings that allow Lincoln a lightly humorous side. Spielberg’s take on the 16th President is genuine, fitted with enormous production design and exquisite lighting that create a stylistic era that works on film. Fitted with prosthetics, Lewis becomes Lincoln, aided by terrific performance and nuances. Sally Field’s turn as a distressed Mary Todd backs Lincoln with additional emotional gravity, a character seen sparingly, Lincoln himself consumed with his Presidency. Casting choices bring with them familiar faces, Tommy Lee Jones, James Spader, and Joseph Gordon-Levitt distractingly recognizable, if inherently capable within these roles. Something about a dramatic reveal of Jones with the light situated in his eyes comes across as forced, a star that feels ill-fit for such a period piece. These become less about historical figures and more about the people playing them. Lewis has the benefit of effects technicians, the rest do not. Lincoln, regardless of the casting decisions, is a precision historical drama, capping itself within four months of time. That leads to tight, focused narrative structure, breathing with clear explanation and depth. Lincoln is never compelled to rush, and although that will lose some of the potential audience in dated dialects or mannerisms, authenticity is appreciated. The film never squanders a chance to bathe in realism or script sequences that sell the period. It is sharply constructed and brilliantly acted. It’s hard to ask for more. Spielberg shoots on film, giving the piece a light, often imperceptible coat of grain which this hefty AVC encode handles flawlessly. Never is the digital nature of compression evident. 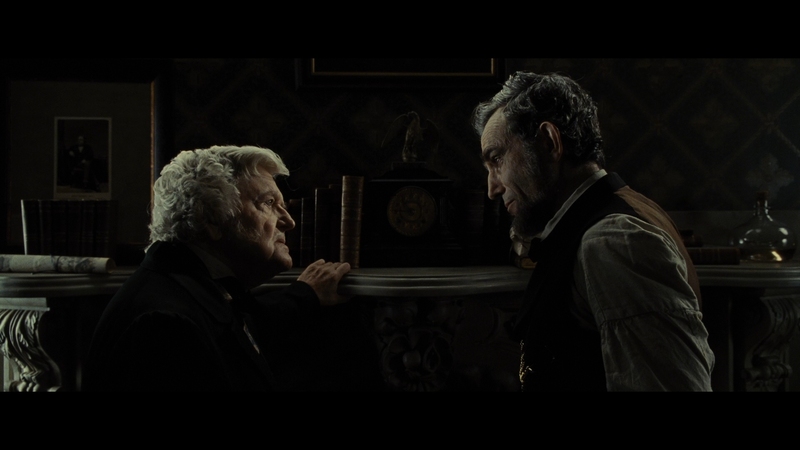 Given plenty of space for the lengthy movie, Lincoln’s Blu-ray is a success from the opening moments of calm. The camera pans down to a soldier, sharpens, and that is where it will stay with few instances of softening. Photography plays with light, keeping the film dark, if intense, when sun begins to beam through windows. Candlelit interiors are carefully constructed to feel natural while applying enough contrast to force facial definition and clarity. Any crush, and many scenes are basked in dense black levels that swallow shadow detail, feels intentional. Many scenes of crowds, locations, or Senate hearings are exceptionally defined, actors identifiable well into the distance with help from the tremendous sharpness. Texture is everywhere, from lavish costumes true to the period to scattered papers strewn about desks. Suits are thick cotton, and military uniforms clearly heavy. On Blu-ray, the production design soars. Color timing is watered down, pale flesh tones and muted primaries serving the majority of the piece. Splashes of color are rare, caused more by vivid sunlight’s orange glow as opposed to any objects. Even the final shots, celebratory as they are, become mired by dim saturation. The style adds a sense of age and weight to the proceedings, more important than visual vibrancy. This is a dramatic piece of visual design, held together by a perfect encoding job. Sound design is surprisingly quaint for most of Lincoln, the opening moments a highlight that will not be matched. Cannon fire and rain highlight a brief Civil War sequence, bass heavy while surround activity sells the scale of the scene. From there, the film sits in quiet meetings with little heft. Senate hearings are one of the few moments of activity, arguing sides fleshed out in the surrounds to capture the activity. A bit of an echo suits the room. Oddly, John Williams score feels barely present, often in the background with little weight or focus. That does not allow for enveloping music, or even dramatic lows. This DTS-HD mix is what it is, and although that sounds generic or superficial, that’s what it comes down to. Know what would be nice to see in the extras? Material on Lincoln. Immeasurable documentaries on the man aside, something appropriate to this late segment of his life would have fit. Instead, a whole 15-minutes of bonuses are included, a brief making-of titled Journey to Lincoln and A Historic Tapestry that details location shooting. How not impressive, and incredibly disappointing.